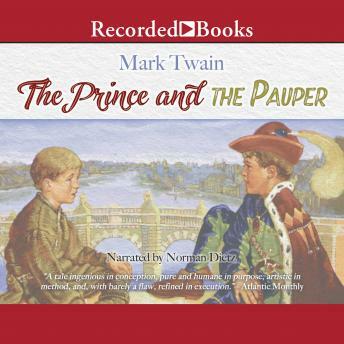 One of the more famous stories in children' s literature, The Prince and the Pauper has become an adult classic as well. Twain' s tall tale about a bedraggled street urchin who becomes king for a day, and his twin, the pampered Prince of Wales left to fend for himself among his seedier subjects, showcases the author' s satirical wit and his acute sense of political irony. The scenes of a young Tom Cantry, wearing the trappings of a prince, but possessing the heart of a beggar, stir both the imagination and the heart. Hearing this familiar story read by Recorded Books' Norman Dietz is a delightful experience that will reintroduce the seasoned reader to our nation' s most treasured storyteller, Mark Twain.